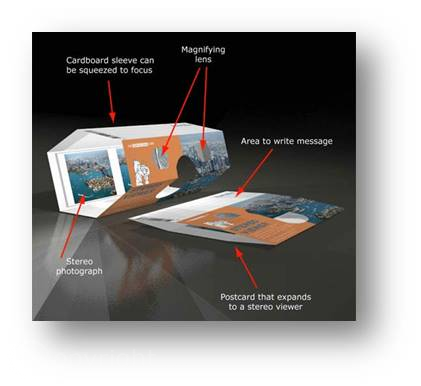 Procedure when ordering a custom-made Amazing Card. The outside of The Amazing Card is normaly offset printed. A 3D-Stereo photoprint is mounted in the inside of an Amazing Card. Less than 2,000 pcs. are printed on a digital HQ printer. A 3D-Stereo photoprint is mounted in the inside of an Amazing Card. Over 2,000 pcs. are printed in off-set. For a cheaper price over 10,000 pcs. 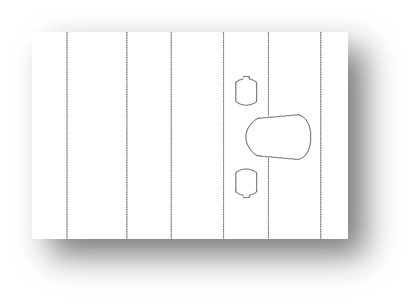 the 3D-Stereo image for the inside may also be printed in off-set, FM Staccato. We design the outside of the card according to your wishes or you can ask your PR department or advertising company to design the Card. Templates are available upon request. The complete design must be delivered in 300 ppi in full size and either in Photoshop, Quark Express or Adobe Indesign. 1) You have already a 3D-Stereo image available. 2) We take a 3D-Stereo picture for you. 3) You can hire our digital Amazing Camera to shoot your own 3D-Stereo picture.